Our final "Before and After" guest is Kim from NewlyWoodwards. Kim is a fellow Quad Citian so that gets her extra points in my book. She has also been extremely kind about promoting this ol' blog. If you are a new blogger (or think back to when you were) you know that it can seem a little lonely on your blog until you get those first few readers/comments and I definitely have Kim to thank for helping a fellow blogger out!! Kim and her husband are renovating pros. Seriously. Pros. I'd hire them. You should check our her weekly renovation reports on Thursdays. I'm not sure they sleep. Kim also has some mad sewing skills...check out this quilt...and this one. Told you...mad skills! Kim is doing a unique "Before and After" that will give you 7 additional blogs to check out as well. Week-end bonus!! Hi, Decor and the Dog readers! I'm Kim from NewlyWoodwards, and I'm thrilled that Michelle asked me to hang out over here today. Like you, I'm a huge fan of all the awesome projects in this corner of the blogosphere - from the DIY headboard to installing crown moulding and making curtain rods (bloody brilliant). But, I'm particularly fond of the chair makeovers at Decor and the Dog. I'm smitten with her cheerful $5 Salvation Army chair, and don't even get me started with her newest winged chair makeover. Love. So in honor of Michelle and her chair-prowess, I thought I'd share seven of my other favorite chair re-dos in the blogosphere. Because we all need a little seating inspiration now and then. Another yellow and white chevron redo, Jen made her own slipcovers for this pretty little nursery rocker. These cheerful little beauties prove that a vibrant hue of kelly green paint can go a long way. And the lovely fabric certainly doesn't hurt. This pretty monogrammed number makes me think that every person in my family needs their own personalized chair. Practical, when you forget which seat is yours. Begging for a good book and a reading light, this chick black armchair could really be my new favorite rainy-day reading spot. Who would have thought something so ugly could turn into something so cute? 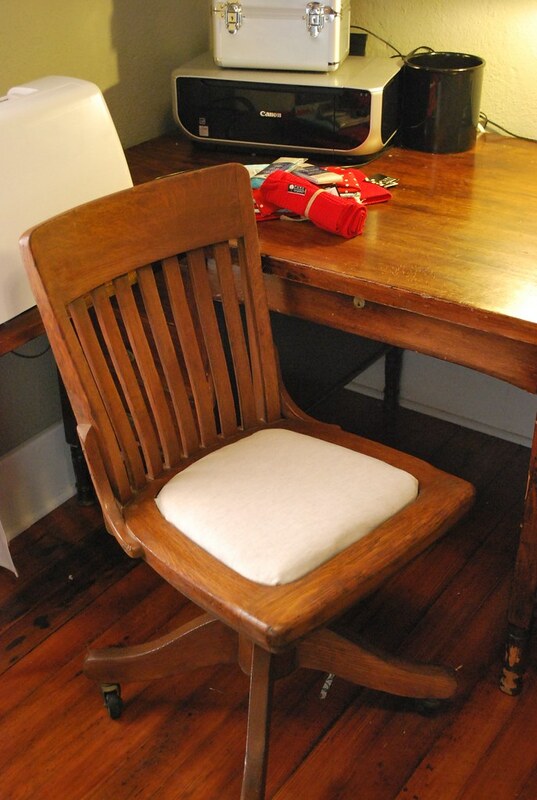 I love this fun makeover of an everyday office chair. 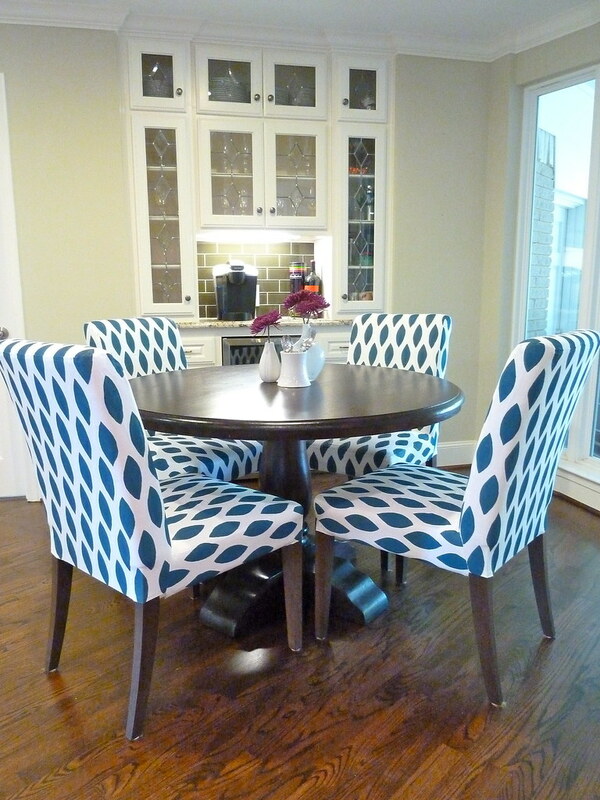 It blows my mind that you can actually paint a pattern on IKEA slipcovers and make it look good. Liz did it. So, there you have it. And while I'm here, of course I have to shamelessly share three of my own chair redos... My first office chair, made over from an old chair given to me by my parents. My second office chair, inspired by Jen and found on Craigslist. I didn't even have to paint this one. I just recovered the seat in nubby linen and scrubbed it down. 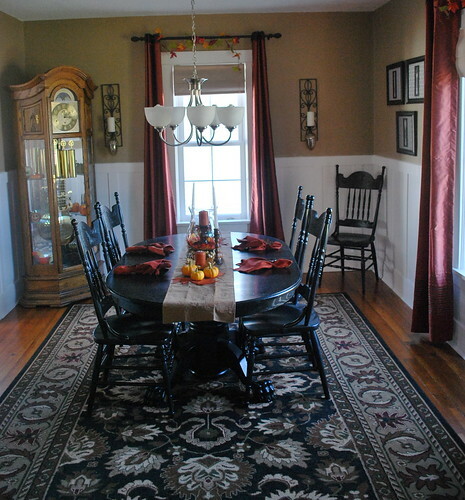 And finally, a black paint job on our dining room chairs made the dated seating look fresh once more. Thanks again to Michelle for having me! Hope you'll pop in to see us at NewlyWoodwards, where we blog about our current house, our newest renovation and any other projects that pop up, which happen more than we care to admit. If you stop over with a bottle of wine, you know I'll have a chair ready for you. Have you done your own chair makeover? Did you enjoy the series? Would you like an opportunity to guest post? If so, contact us at decorandthedog@gmail.com! Don't forget about our $50 PetSmart Gift Card Giveaway...enter here!...it closes at 11:59PM today!